Summer has come and gone in the blink of an eye, and the season that everyone loves to hate is fast approaching – winter. Waking to dark mornings paired with frosted car windows are a thing of the present. Rather than pretending winter doesn’t exist, being prepared is the best way to avoid the stress of the first snowfall. Is your Mercedes-Benz winter-ready? 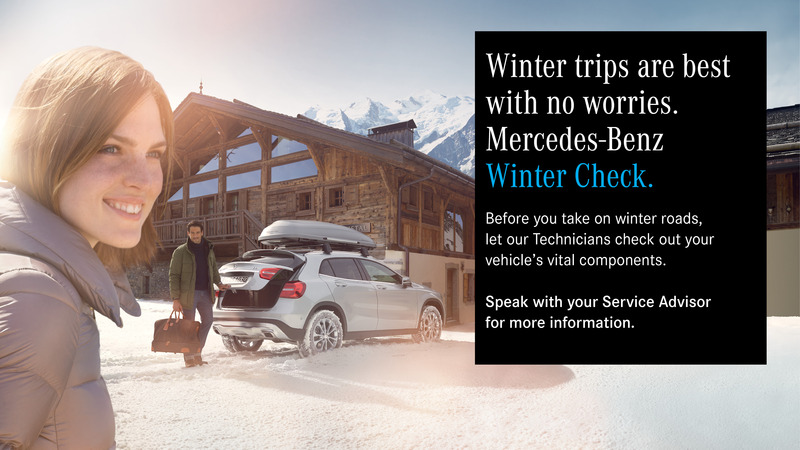 The team at Mercedes-Benz Kamloops want to remind our customers how to stay safe this winter by having their MB fully equipped to take on the snow. First things first, getting your Benz ready for the transition into sub-zero temperatures. With these four easy steps, your Mercedes will be ready to battle the elements in no time. First, you should get any existing rock chips or cracks in your windshield filled so they do not expand over the winter, which will end up leaving you with an unsightly windshield repair bill! Second, when is the last time you changed your windshield wipers? Genuine Wiper Blades reduce wind noise, ice and snow buildup, and are designed to fit the geometry of your vehicle’s windshield. To keep a clear view of the road in harsh winter conditions, we recommend you replace your Mercedes-Benz Wiper Blades annually. Lastly, fill up your windshield wiper fluid with the appropriate kind — make sure the fluid is made specifically for freezing temperatures. Don’t take the chance of damaging your engine because you have improper water and antifreeze levels! The Service Advisors at Mercedes-Benz Kamloops will be able to recommend the proper type of antifreeze for your Mercedes-Benz, so if you’re already questioning your mix, make sure to book your service appointment at mercedes-benz-kamloops.ca. Since our roads are covered in snow and ice for most of winter, it is advised to upgrade your tires to their appropriate winter shoes. At 7°C and below, Mercedes-Benz Approved Winter Tires are designed to keep traction in even the coldest of climates. Reducing stopping time in wet slush or slick ice more effectually than summer or all-season tires. Your Parts Advisor can help you find the right ApprovedTires and Genuine Wheels for your vehicle. And if you already have winter tires, our seasoned mechanics will install your winter tires with expert precision. Be rest assured knowing that Mercedes-Benz ApprovedTires provide the perfect relationship between tire, road, suspension and safety systems. Did you know your vehicle’s headlights need TLC? Yes, just like every moving part in your vehicle, your lights need to be in working condition. Winter tends to bring with it, fog, so make sure your fog lights are in working order and that your brake lights are fully functioning so when you need warn the drivers behind you to slow down and fall back a little bit, you can. Mercedes-Benz Kamloops is your one stop for full vehicle winter preparedness. Winter doesn’t have to be that dreaded storm on the horizon. If you get your car ready now, by the time that first snowfall hits, you’ll be ready to enjoy winter and all it has to offer!